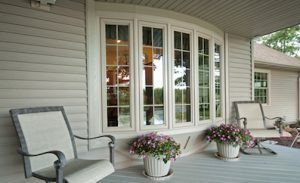 Bay and bow windows replacement windows add style and dimension to both the inside and outside of your home. From the outside looking in, bay and bow windows never fail to impress and add instant curb appeal. From the inside looking out, bay and bow windows create additional space and character within any room. Bay and bow windows can also add extra seating to your home. 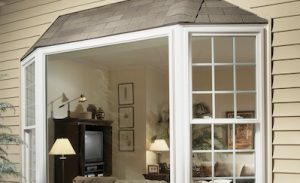 What are the key benefits of bay and bow replacement windows? A combination of three or more angled windows make up our classic bay and bow windows. They can be casement, double-hung or picture units depending on the need. By using more windows, bay and bow windows allow more light in and also give you extra space inside your room. Ranked #1 for quality in Builder Online’s 2013 Brand Use Study, our vinyl windows and doors are recognized as leading products in the industry. Consumer Reports calls Simonton “top-rated” when measuring the performance of vinyl double hung windows. You can read more about how Simonton aces third party tests here.